A reconstructed fractured soda lime silicate Pyrex bowl. Arrows outline crack paths. Pyrex first achieved popularity for baking purposes. It is durable, odor and stain proof. Even the name 'Pyrex' is said to be taken from the word 'Pie' and 'Non-expanding'. Borosilicate glass, the main componenet of Pyrex has a low thermal expansion characteristic. Aside from kitchenware, Pyrex is also used in laboratory tools. The telescopic mirror used at Palomar Observatory is made out of Pyrex borosilicate glass. 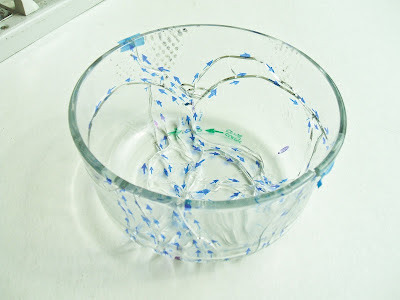 Currently, news and reports abound of pyrex glassware "explosively shattering". Even Consumer Reports have released two articles on this phenomenon. A new paper appearing in the September 2012 edition of the Bulletin of The American Ceramic Society for the first time provides a scientific explanation of why some glass cookware sold in the United States is more susceptible than others to "explosive" shattering and the possibility of exposing consumers to injury from flying glass shards. Clear glass baking dishes and pots are a staple in many households around the world and have been since they were first introduced in 1915 to consumers by the Corning Glass Works, which created the Pyrex brand name. The original Pyrex cookware was made of a specific, thermally strong composition known as borosilicate glass. The durability of this glass, originally advertised as an "oven to icebox" and "icebox to oven" product, was startling at first, but eventually became taken for granted by generations of consumers who often passed on the rugged vessels to family members and friends. In later years, Corning competitors, and eventually Corning, itself, substituted a different glass composition—soda lime silicate glass—for the borosilicate Pyrex cookware. R.C. Bradt and R.L. Martens, the authors of "Shattering Glass Cookware," became interested in the topic after hearing anecdotal reports of glass cookware shattering and reading reports of cookware failure and related injuries in publications such as the January and October 2011 issues of Consumer Reports. Consumer Reports and others documented that the explosion-like glassware failures seemed to be linked to rapid changes in temperature, such as when the cookware was removed from the oven and placed on a counter or dinner table. The publication also noted that virtually all of the reports of glassware failure involved vessels made of the soda lime silicate glass. In contrast, the magazine reports that there are no reports in Europe of explosive cookware failure, a region where nearly all of the products sold are composed of the authentic borosilicate glass (manufactured and marketed by a separate company, Arc International). Bradt, a professor of materials engineering (emeritus) at the University of Alabama and Martens, manager of the university's Central Analytical Facility, sought to make sense of why the soda lime silicate glassware is prone to thermal stress failure. Bradt and Martens applied basic materials engineering concepts—such as thermal stress, elastic modulus, thermal shock and temperature differentials—to the borosilicate and soda lime glasses. Bradt and Marten do note that all manufacturers of glass cookware warn consumers against placing hot vessels directly on a countertop or a moisture-containing surface as a precaution against rapid temperature changes that could trigger the explosive-like shattering. Practically speaking, however, the authors also note that a typical kitchen might easily be an environment for glassware failure. "From the perspective of kitchen applications, a good calibration point is that of boiling water 100°C (212°F)," write Bradt and Martin. "None of [our] calculations suggest the soda lime silicate glass would be likely to survive a rapid exposure to boiling water." Bradt and Martens also investigated manufacturers' claims that they use heat strengthening or thermal tempering processes to increase the soda lime silicate cookware's resistance to thermal stress fracture and, should breakage occur, encourage the formation of small glass "dice" instead of sharp glass shards. After using a variety of methods, including fracture and fringe pattern analysis, Bradt and Martens say they found some evidence of heat treatment, but warn the treatment "does not appear to be sufficient to increase substantially the thermal stress fracture resistance of the cookware, nor is it sufficient to create a desirable dicing fracture pattern for the glass cookware." Bradt and Martens emphasize that consumers should read and follow the warnings contained in the glass cookware packaging. However, based on their research, they conclude by warning, "the margin of safety for avoiding thermal stress failures of soda lime silicate cookware is borderline. It does not appear to be adequate for all household cooking."